Long, long time ago, there was a small boy who wasn't nearly as tall as he is now. He liked the usual kind of things a boy of nearly three enjoys: going to the park (but not to the shops), playing with his trains, and making plans for becoming a world famous racing driver. And when he wasn't doing any of those, he could often be found stationed at the window, looking out for his Auntie Catrin. That little boy reckoned then (and today most probably still does) that on the scale of excellent aunties, his Auntie Catrin was hard to beat. She thought of the best places to go, she knew all the fun that was funny, and she always - always- had a small something ready as a treat. Comics, stickers, new pencils, you name it, Auntie Catrin had a ready supply and that rascal knew it. He would wait til she was nicely settled with a cup of coffee (and possibly a Danish Pastry) and then he would sidle up to her "What my like?" he would say (which, for a three year old, is, I reckon, a pretty crisp combination of both firm charm and engaging directness). And, of course, she would instantly, reliably, prove that she knew exactly what he liked, magically producing - a racing car, or some balloons, or (best of all) a new train for the collection. 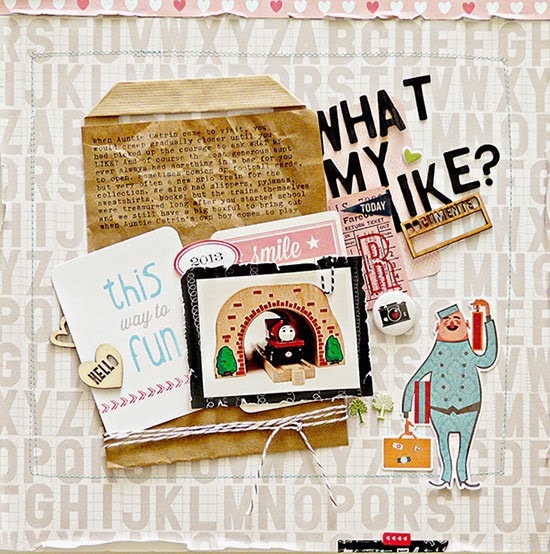 This page was made for Get It Scrapped and the new article there on Ideas For Scrapbook Page Embellishment With Found Objects. I discovered a plain brown paper bag, in my pile of maybe-I'll-reuse-that-someday stuff and used it as a space to type my journaling. It's my way of reinforcing the story: a bag to wrap a gift, recycled as part of the tale itself. There are lots more ideas on re-using found items - at Get It Scrapped. So, I guess the definition of 'inspiration' is something that makes you want to go and do the same thing. And right now I'm really feeling like scrapbooking. It's a great page and a really lovely memory to have documented. Fortunately I'm out at the crop all day tomorrow - so will hopefully channel some of your scrappiness then. Such a beautiful page! I loved reading this post! The bag looks perfect....and what a lovely story to go with this page. I'm ashamed to admit I recycled a paper bag today....maybe I should go and pull it back out of the wheelie bin! What a lovely story, and a lovely page to share the details on. I absolutely love this post! And you know how I feel about Aunties, having met mine. For The Boy Child, we would substitute Granny for Auntie when it comes to treats in handbags. Another great layout with a great story. I like your use of the paper bag as your journaling spot. I'll have to give it a try. Plus, I've been thinking about using my old typewriter---haven't used it in awhile. Fantastic layout and I love the story it was inspired by, his auntie loved him so much! I absolutely LOVE this layout! Our children are very lucky to have special aunties as well - especially when they bring out special items accompanied by a chocolate frog! 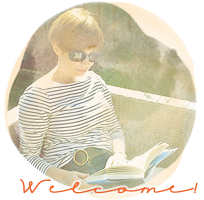 Siam, you make the most beautiful pages and write the best blog posts. It's always a delight to drop by for a while. I pinned this straight away :-) Inspiration at its best. 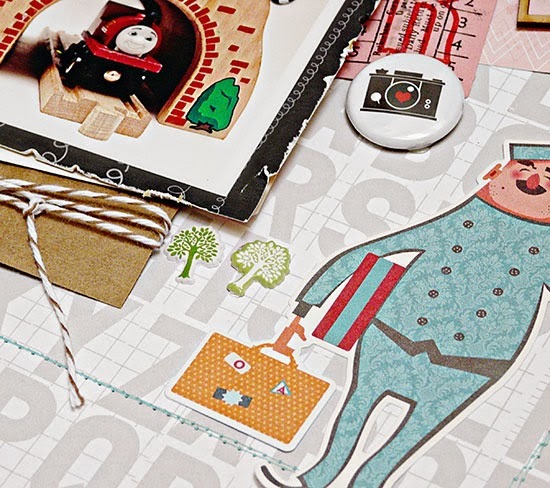 I just love this layout, and what a great idea to use the bag for journaling. I love all the embellishments here---you are truly a master at this! Wow, great page and wonderful story! Lovely page and such a wonderful story to go with it! Such a cute page & a wonderful story to have documented. I know I have a few little bags in my Cultural Memorabilia box - just might have to use them for journaling soon! Thanks for the inspiration! This page is just beautiful Sian, I love the story too but most of all I am thrilled that I no longer have to 'hide' brown bags from the inevitable "What on earth? ..."
This is such a great memory to record and I love the way you did it... without including a photo of the protagonist! That's brilliant! You know what I think is just the sweetest thing? That your boy's aunt now has you to be a sweet auntie to her own boy. Nephews are just so wonderful! This is so beautiful! I love the way you string your thoughts together and bring us along with you on the journey. What a lovely layout and it sounds like TTO was just as fortunate as Little E in having a great auntie.